Welcome to the worlds greatest guide to Women's Khaki Pants. Are you actually looking for a Women's Khaki Pant? Well, we hope you are because the reality is that you have found our Women's Khaki Pants page. In this women's clothing section of the Apparel Search directory, you will find all sorts of interesting information regarding Women's Khaki Pants. Apparel Search is a leading guide to fashion, style, clothing, glam and all things relevant to apparel. We hope that you find this Women's Khaki Pants page to be helpful. Khaki is a textile fabric of a dull brownish-yellow color, in particular a strong cotton fabric used in military clothing. Women's khaki pants would be clothing, especially pants, made of khaki fabric. In Western fashion, it is a standard color for smart casual dress trousers for civilians, which are also often called khakis. In modern women's fashion, khaki pants are not only in the khaki color (brownish-yellow). 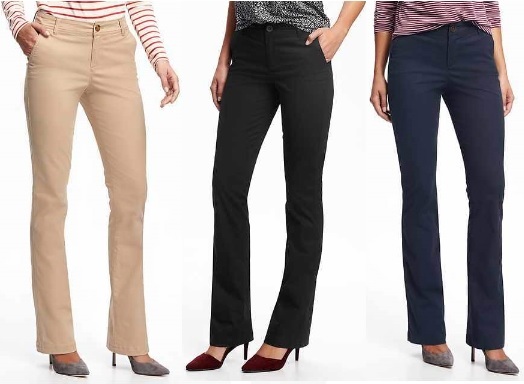 Women's khaki pants actually come in a wide variety of colors. This versatile style is appropriate for casual wear as well as many dress occasions. Named for the Indian word for tan, the color of dust, and made of natural fibers such as cotton, wool and linen, this garment can vary in color from very light to dark. The khaki pant you’re used to actually comes from India; there, British military officers, wanting to keep it lightweight while blending into the surrounding territory, developed khaki as we know it. It was adopted by sailors and shore men across the globe, who loved its utilitarian construction and material. We assume you already have a pair of khakis in your wardrobe. If not, khakis are the perfect addition to your closet. If you want to be even more stylish, you should wear your Women's Khaki Pants. Learn more about khaki pants in our fashion influence section.